Ask yourself...If this sort of remeditiation work was happening on Elmwood Avenue...what sort of safety barriers would you see...Plywood or concrete? 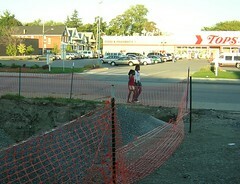 How about an 8' hole about 12' long next to a side walk...it wouldn't happen on Elmwood, would it? A few months ago while checking out the old "Sweet Kleen Laundry" site on Kenningston Avenue, I found that environmental clean-up project to be an invition to neighborhood kids, too. See those pics...Sweet Kleen(ed) and Sweet Kleen(ed) - FollowUp. 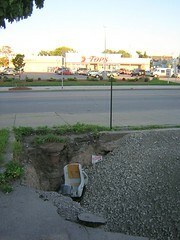 I know...It's only Jefferson Avenue...and so it goes. Related Post: Am I expecting too much? The bench was never replaced! 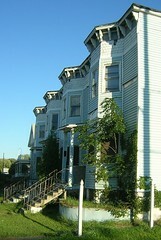 Frequent readers of this blog know that the Woodlawn Row Houses sit diagonally across from one of Buffalo's public schools. The site is currently being used by Waterfront School on a temporary basis and will soon become the new permanent home of Performing Arts High School. This afternoon I re-boarded the Woodlawn Row Houses and took these pics that show the gradual decline of this "local-landmark" and City of Buffalo owned property. 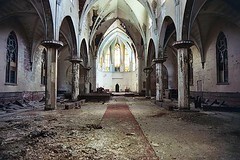 This is a text book example of "demolition by neglect." Masten District Councilman Antoine Thompson and Common Council President David Franczyk - who seems to be more interested in the "historic" property of Perrysburg, NY more than he is here in Buffalo - know about the condition of this building...and do nothing. The complete archive containing monthly pictures of the decline of this City of Buffalo owned property that was designated a "local-landmark" by the Preservation Board is available here. I heard today from Tom Trathen's attorney, Scott Cannon, that the City of Buffalo's Law Dept. plans to appeal the outcome of tomorrow's decision which most certainly will favor Tom Trathen. He wants to start paying Perrysburg property taxes and get along with some economic development 40 mile south of Buffalo. To make matters more confusing our very own Common Council voted 7-1 early this summer to remove a clause from the property's title which prevented Tom Trathen from buying the property. Read that strange story here...David Franczyk, Common Council President was apparently enjoying the Italian Riviera while that vote was taken...go figure. Cattaraugus County Judge Larry M. Himelein has scheduled an Oct. 6 hearing on the suit filed by several plaintiffs, including the group Friends of J.N. Adam, two residents of the Perrysburg area and Buffalo Common Council President David A. Franczyk. The skirmish puts Franczyk, an opponent of the sale, in the position of suing the city for which he works. Various state agencies and the president of the logging company are also named in the suit. I don’t believe an elected public official in the history of Buffalo, while still in office, has ever been party to a law-suit against the City, the entity he is supposed to represent. On the one hand, now that he is back from Italy, he’s directing our Law Dept. to squander limited resources and file an appeal based on the most probable outcome of tommorow's Cattaragus County Supreme Court ruling in Little Valley, NY. On the other hand he's forcing the City of Buffalo to defend itself against a lawsuit that the so-called friends of JN Adam are forcing down our throats. I've been reporting since December, the former JN Adam TB Hosptial in Perrysburg, NY has been closed since 1993. The City of Buffalo had a 10 year opportunity to do something about the place. They decided to do nothing. Yet when Common Council President David Franzyck heard that Tom Trathen, a logger from Livingston County, signed a purchase contract for the 650 acres he set in motion a strategy to try to "save" JN Adam. Common sense says that we have to save ourselves from David Franczyk. David Franczyk claims to be a preservationist, yet has done NOTHING to help save the Woodlawn Row Houses or the Wollenberg Grain Elevator. Both of these properties are located on the City's east side. 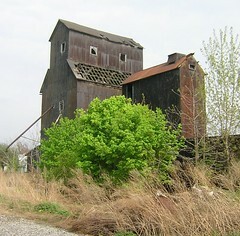 The Woodlawn Row Houses were designated a local landmark in 1981 and the Wollenberg Grain Elevator was placed on the National Register of Historic Places in 2003. 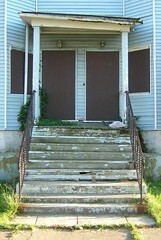 Both of these properties are abandoned, boarded, derelict and vacant. There is no plan. The Woodlawn Row Houses sit 50 feet away from a Buffalo Public school and the Wollenber Grain Elevator is 100 yards away from the recently renovated Emerson school on Sycamore Street in the heart of Broadway Fillmore where David Franzcyk presumably still lives. 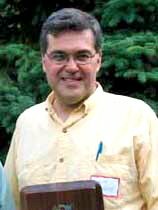 Meanwhile, please contact -- Brian Lipke - Control Board, Chairman to voice your dismay and disappointment at David Franczyk's dereliction of duty. Let him know that you think our Common Council President should be thinking of Forest Avenue here in Buffalo and not the forest in Perrysburg, 40 miles away. Kristen Becker let me know today of her efforts at organizing a fundraiser for NOLA folks. I had an opportunity to sit down with her yesterday to review some of her new organizations preliminary plans. High on the list is housing...for displaced NOLA artist folks. And of course I started in on just how cool it would be to use the Woodlawn Row Houses for just such a mission. Proximity to Artspace and the future permanent home of Performing Arts High School...cool. On Friday September 23rd, the newly formed not for profit New Orleans Lagniappe Association (NOLA) will hold its first monthly variety show The Voodoo VarietyHour at Nietzsche's in order to benefit those relocating to Buffalo. The show wil consist of a wide range of performers, from comics to spoken word to musicians,as well as an art auction, and raffle. All donations are welcome. Having lived in New Orleans and loved the people there, I feel a tremendous need to get involved. Living in Buffalo now, I feel a need to let all the great people of New Orleans know how great Buffalo is, so NOLA will try to offer incentives for people to move their southern based businesses into the city of Buffalo. This is a chance for our city to be forward thinking. There are alot of people who need a home and the one thing we have plenty of is buildings that need a little love, to make them a home. Elizabeth over at BuffaloSpreeBlog picked up Kristen's announcement, too. Check it out, Kristen set up a new Buffalo based blog for this fundraising effort, Voodoo Variety Show!